On Saturdays I like to take a long walk, when the weather is bad I go to the mall before they open and walk for a couple hours. I get lots of window shopping time but since the stores aren’t open I save lots of money! This Saturday Pottery Barn was having a Special event and they were open early so I just had to go in! When I shop someplace like Pottery Barn I never spend money because almost everything I see I think “oh, I could make that!” I love the inspiration but some of those prices? 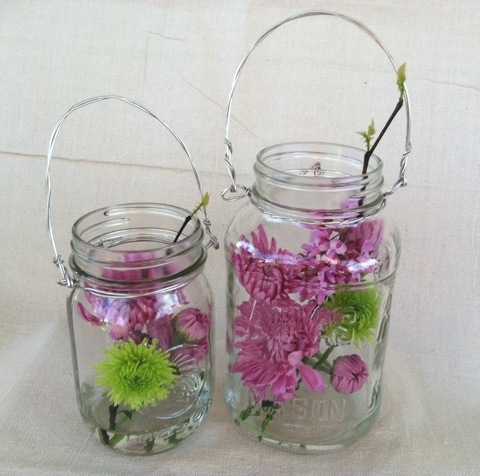 What caught my eye this time were the canning jars wrapped with wire that you could hang or place on a table. They were really cute, and honestly not very expensive ($7.50) if you only wanted one or two. But I want more! I imagine them hanging throughout my yard on a warm summer evening and in my imagination there are quite a few. And besides, it is always more fun to make your own especially when something is this simple to do. Jars – Canning jars are around $12 for a case of 12 – but I already have jars! 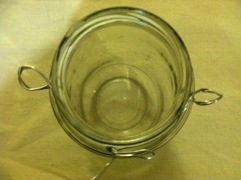 I save jars that are interesting, for example I buy Classico pasta sauce and the Jars are stamped with the Mason logo. 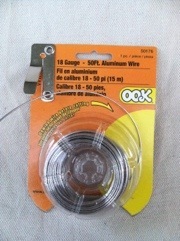 Wire – I found 18 gauge aluminum wire in the hardware picture hanging section $3 for a package at Home Depot. 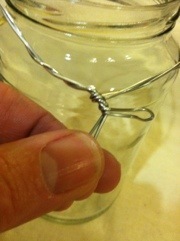 How to – I cut a length of wire long enough to wrap a little over 3 times around the jar. 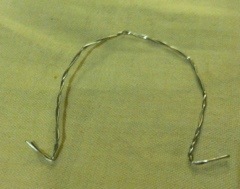 I folded the wire in half and gave it several loose twists. I wrapped the folded wire around the jar just under the lip and twisted the ends together leaving ends just under an inch long. Place this over the jar just under the lip and hold both ends of the oval and twist them into a loop on each side of the jar. You might want to use a pliers to get it nice and tight. 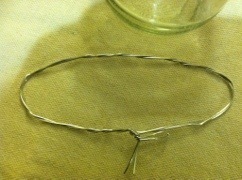 For the handle I measured about 23 inches of wire, again fold it in half and twist it several times. shape it into a U shape and bend the ends up about an inch. Loop the ends through the loops on each side of the jar and twist the ends around. 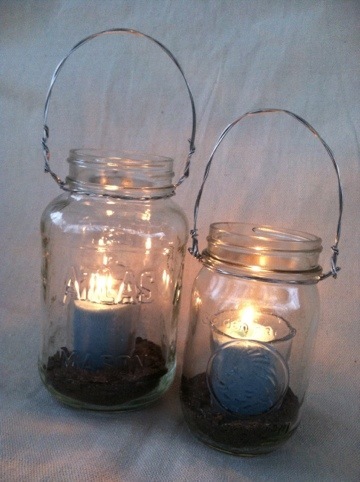 Now you can put some sand in the bottom and a votive candle, or water and flowers, or whatever you want. 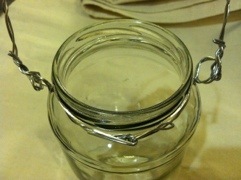 For $3 I made 3 jars and have enough wire left to make a few more. I need more jars – guess we’re having spaghetti for dinner this week! What a great and inexpensive idea! There is nothing I love more than inexpensive ideas! Jessie- if you are making a bunch, Home Depot had a larger spool of the aluminum wire for about $6 look in the hardware section!